The third annual Asian American Music Festival will be held on Saturday, May 20, from 5:30 to 9:30 p.m. at the Aratani Theatre, 244 S. San Pedro St. in Little Tokyo. One of the most versatile and cosmopolitan saxophonist in pop, soul and contemporary jazz for over 35 years, Michael Paulo is producing the AAMF once again, bringing its unique sounds in celebration of Asian Pacific Heritage month. It features some of the most renowned Asian American Artists in America, who have made inroads on a national and global scale. Vinnie Aguas, 14-year-old child prodigy, on drums. 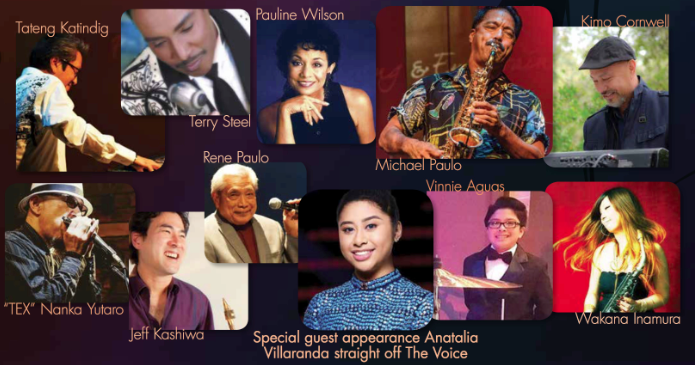 With the sponsorship of Kings Hawaiian, Paulo has created the Kings Hawaiian All-Stars, who consist of Hawaiian piano legend Rene Paulo and Hiroshima keyboardist Kimo Cornwell; saxophonist Michael Paulo; Grammy-winning vocalist Pauline Wilson; bassist/vocalist Bruce Hamada; and one of Hawaii’s top guitarists, Fred Schreuders. Making his third consecutive performance is Rene Paulo, who is also the father of Michael Paulo. The Hawaii National Academy of Recording Arts lauded him with the prestigious Hoku Lifetime Achievement Award for his contributions to the music scene in Hawaii. Michael’s mother was a professional singer, and together his parents influenced his journey into the world of music. During each year’s festival, this father-and-son team has appeared on stage together. A portion of the proceeds from the AAMF will benefit the Japanese American Cultural and Community Center and the AAMF Music Scholarship Fund. The first AAMF scholarship will be awarded this year to Austin Gatus who at a young age has found a way to give back and help others with performances for children undergoing treatment at Rady Children’s Hospital, Starlight Foundation and other organizations that help kids fight cancer. Austin was one of those kids, but is now a cancer survivor. He is currently attending UCLA on a scholarship and will use the AAMF funds to augment his education. “With my lifelong passion for music, I’m hosting an event unlike any other that primarily focuses on the Asian culture embracing American music Culture such as jazz and R&B,” said Michael Paulo. “As America is a melting pot of cultures, it is important in the assimilation of Asian culture to embrace things that are uniquely American. It is through this that we can become a part of the mainstream culture. Paulo has excelled both on the artistic side and in business. As an artist his career has spanned four decades. He has produced numerous events for the past 20 years and ran his own record label in the ’90s. He cut his teeth as a member of the band Kalapana and was the featured saxophonist for the legendary jazz vocalist Al Jarreau for 12 years. With ten solo releases to date, Paulo is one of the most influential Asian American saxophonists in the world. As a performer and producer, Paulo has participated in major jazz festivals around the world. His current projects include three festivals, three jazz concert series, and hosting private events. Through his performances and events he has raised over a million dollars for charitable causes. Doors open at 5 p.m. VIP tickets, which include a meet-and-greet reception, are $250; orchestra seats are $50 and $35; balcony seats also available. For more information and to purchase tickets, go to www.asianamericanmusicfestival.com. A: It was on a whim. I took a band class my first year in high school to get out of PE class. That’s when I took up the sax and absolutely fell in love with it. The school was short on instruments so my teacher asked if I could borrow an instrument. My uncle had a sax and that’s why I started playing the sax. Q: Who were your influencers and mentors? A: My first teacher was a jazz fanatic and started me playing jazz. My second teacher had played professionally in L.A. and he gave me the background to pursue a career in music. As far as influences, I listened to Charlie Parker, John Coltrane, David Sanborn, Grover Washington, Tom Scott and Miles Davis. Q: Do you have a “ah ha” career moment? A: Yes, the first big concert with Kalapana when I was 19 in front of 11,000 people. I felt then that I could make a career out of playing music. I knew then that anyone can learn to play an instrument but to make people respond emotionally was a gift. The response I got that night was phenomenal. Q: What are the other music festivals you are involved with? A: Currently I produce the Temecula Wine and Music Festival (12 years), Grooves at The Westin (three years ), smooth jazz concerts in Hawaii (eight years), was the music director for the Dolphin Days Festival in Hawaii for 14 years, and for nine years I was artist-in-residence for Java Jazz festival. Q: How did the idea come about for the AAMF (formerly known as Asian Heritage Jazz Festival)? A: I had a friend at State Farm Insurance that wanted to be involved with a concert event, and sponsored the first year. I wanted to do something different than most jazz festivals in L.A. Being Asian and from Hawaii, I thought, why not highlight our Asian heritage and feature some of the best talent we have that are on par with talent on a world scale? A lot of people don’t associate Asians with jazz or mainstream music. As one of our artists joked, when she tells people she is a musician, they assumed she played the violin in a symphony. We are expanding our reach to include international artists and have partnered with the JACCC the past two years to produce the event. A: After 40 years in the business I am able to draw from knowledge and relationships gained performing and producing. It’s a difficult hat to wear sometimes being on both sides as a producer and performer. What were they? Touring and recording with Kalapana in the early years, touring with the great Al Jarreau, managing my own record label for seven years in the ’90s, and being involved with music festivals as an MD and consultant provided me the experience needed to create the AMMF. Q: What do you hope to achieve with a scholarship fund? A: I hope to encourage minorities like myself to pursue their musical dreams and aspirations and make it a little easier for them. As a young student I wasn’t able to attend college because of financial limitations. Instead I attended the “school of hard knocks” on the road. but sometimes wonder what I could have done if I had the opportunity to study music and get a college degree. Q: What are your goals for this festival? A: First of all, I would like the public to experience the immense Asian talent that is out there and they are not familiar with. Along with that, give those artists the opportunity to be seen and recognized for their contributions to the music scene in the U.S. and abroad. Q: Why did you change the date to coincide with Asian Pacific Heritage Month? A: Being that one of my biggest goals is to highlight accomplishments of Asian artists, it is a natural fit to celebrate those accomplishments during Asian Heritage Month. Q: What is the definition of ‘success’ for you? A: Success is when people leave my concerts with huge smiles on their faces.